Good morning everyone! It's time for another Thursday challenge from Create with Connie and Mary! This week we have a color challenge! Take a look at these interesting colors! 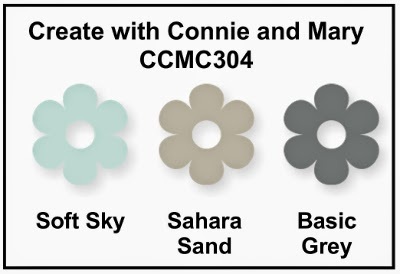 Soft Sky, Sahara Sand and Basic Grey are the colors that we are to work with this week! I love all three of these colors but never would have thought to put them together! I was so excited to put something together with them but came up blank. So I started searching through some cards I had pinned on Pinterest and got some ideas that I could put to use. This is what emerged! I love how this turned out! And it is really simple! There you have it! I hope you are inspired to play along with us this week! I can't wait to see what you do with these fun and fabulous colors! Check out more awesome creations at the Create with Connie and Mary website! Thanks for stopping by and have a super day! What a great idea to use the word bubble shapes without words! Love how you arranged all of the elements of your card together. It is fantastic. I agree - I would never have thought of using these colours together, but they look great. Love the way you used the word bubbles behind the sentiment too. Pretty, Pretty, Pretty! Nice combination of all the elements! I LOVE how you used the word bubbles as layers!!!! So clever! Great job with the color challenge this week! You did a really fun card! I love the layering of word bubbles, so unique! I love what you came up with! It is soft yet dramatic and I love your use of the word bubbles! A fascinating look! Love it!